During the course Robotic City, the Master in City and Technology students had the chance to collaborate with the Why Factory and set a goal of drawing out the future of cities. When thinking about the future of our cities, we can have approximate answers, possible beliefs and different degrees of certainty about a variety of things. We cannot really be absolutely sure of anything and usually the further we look into the future the less we know about most things. We divide ourselves in optimists, pessimists, utopians, dystopians, glass-half-full and glass-half-empty and yet we forget that progress is not made by those who, out of fear adapt to the world, but by those who persist in trying to adapt the world to themselves. It’s much more interesting to live with doubt and not knowing, than to have answers which might be wrong. Therefore, we should not feel frightened by the nuances of our world today or tomorrow, because in the end we don’t have to know the answers. We only have to be curious enough to discover the joy of finding things out in order to create visions of worlds that not only give us hope for tomorrow, but also deepen our understanding of today. A vision has the power to become the fuel of progress for many generations, as they allow us not only to actively wonder and question progress but also, to imagine it. With this in mind we set out to describe the future of the Schouwburgplein square in Rotterdam. 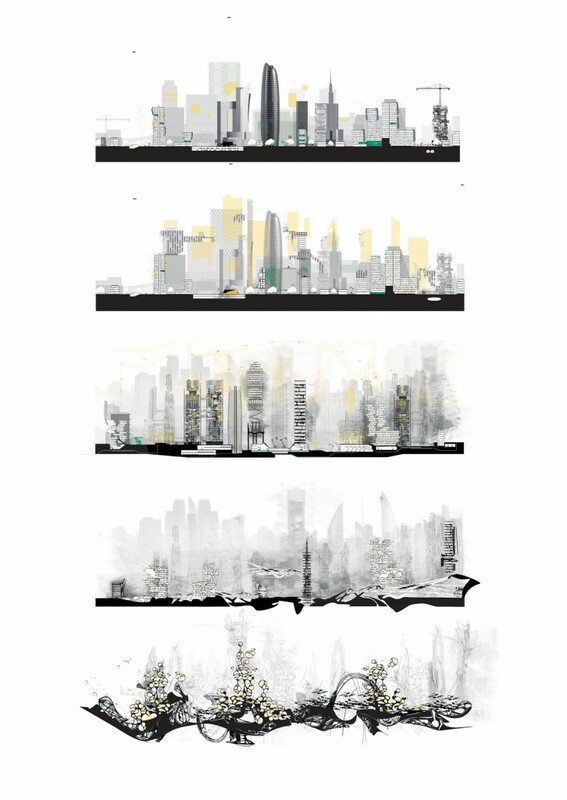 By capturing a section of the city, we tried to draw out its future in the next 5, 10, 50, 100 and 200 years. In order to achieve that goal we speculated on the future of the current technologies, automation, computation, biomaterials, 3D printing, robotic and drones. 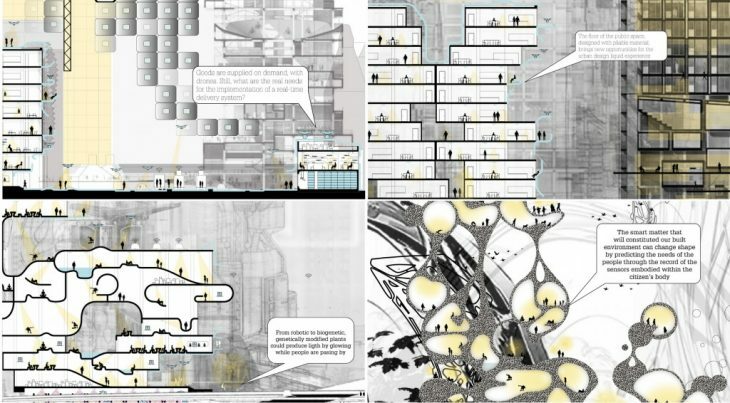 We made the respective timelines of the growth of these technologies and then overlapped them, only to discover that the future of our cities looks messy. We asked questions like “what will the human body look like?“, “what if humans could be robots?”, “what if we could live in a fully flying environment?”, “what if nano-bots could integrate and disagreggate matter?” along with many other questions that challenged us in our effort to imagine the future. 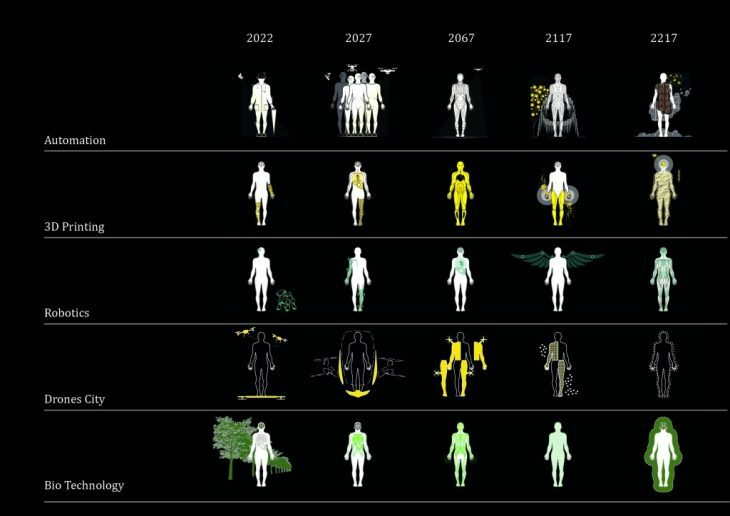 By bringing the time-line, the catalogue of technologies, the human timeline and our questions together, we framed the context and we applied a systematic approach to depict our speculations on how these technologies would manifest in the selected section during the years 2022, 2027, 2067, 2117 and 2217. We were not only interested on the evolution of the city’s skylines but also on the evolution of the details of the urban life that define a city’s feel and character. That’s why we also zoomed in the city to have a more detailed look at the way that technology affects the city.